Multipass for four films (excluding Aliens) is available for €35 at IFI Box Office. Is mankind alone in the universe, and if not, are his extra-terrestrial neighbours friendly? Save for a few peaceable exceptions, filmmakers have historically answered this timeless question with a resounding ‘no’, depicting alien visitors as remorseless destructors hell-bent on annihilation. The films chosen for this year’s Dark Skies science-fiction festival are a testament to just how nasty these inter-species encounters can be; from the hostile Martian invaders in Byron Haskin’s adaptation of H.G. Wells perennial The War of the Worlds, a key entry to the 1950s sci-fi cycle, to the shape-shifting horror of John Carpenter’s modern classic The Thing, intergalactic emissaries rarely come in peace. Keep watching the Dark Skies! 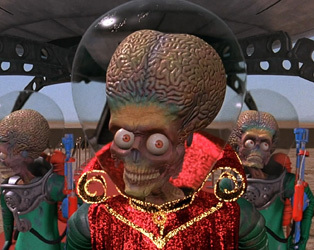 DARK SKIES: INVASION: MARS ATTACKS!